"Large room with comfortable beds and decent bathroom." Have a question for Olivaer Apart Hotel am Kurfuerstendamm? Restored to an old German style, the 73 surprisingly spacious rooms at this 3-star property combine the past with the present. Guests can dine in-house while enjoying spectacular views over the surrounding houses all the way to the nearby Memorial Church. The location is perfect for exploring the city as the historical points of interest are easily walked to. The nearby subway stations allow guests to venture to locations a bit further off. Restaurants fill the surrounding area, and the Italian food of Keno makes it one of the more popular dining establishments around. 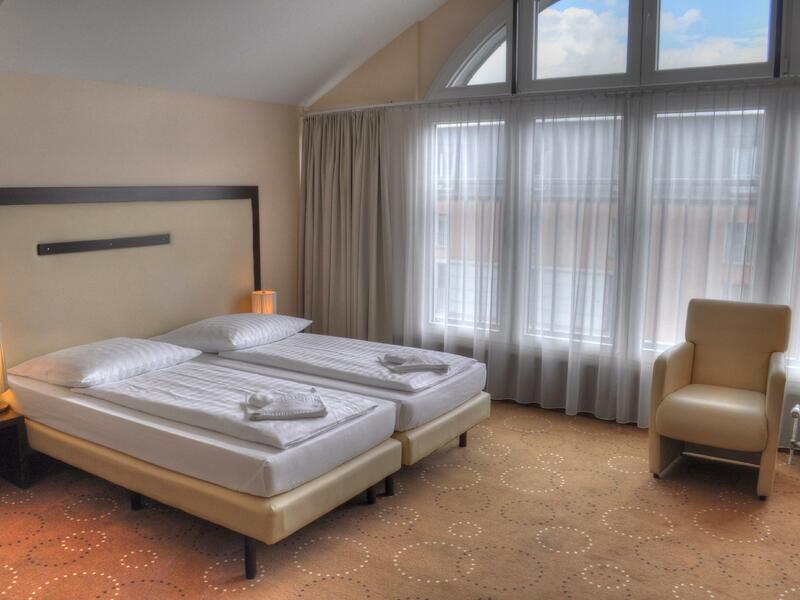 A budget-oriented establishment, Olivaer Apart Hotel am Kurfuerstendamm is a great way to stay near everything without spending everything in order to do it. Very good location and good price. Very Noisy & the staff is rude and very unfriendly. Large room with comfortable beds and decent bathroom. Decor needs updating, but location and cost fine, and front area being rebuilt at present. Quiet room on third floor overlooking main street. We would return. Room too small, old, dirty. Suitable to those who are looking for limited budget traveling. Considering that we booked this place because it was advertised on Agoda as a place with "free Wi-Fi", we were quite disappointed to be informed that you have to PAY for Wi-Fi even in the lobby. We felt that it was false advertising because we actually needed Wi-Fi for our travels. We asked why they would charge for Wi-Fi when the site stated "Free Wi-Fi", "WIFI in public areas", and then "Free WiFi access (may be charged in some rooms)", and the front desk lady disregarded everything and just answered that everyone has to pay for Wi-Fi for x-Euros for 24hours access. We wouldn't have been so upset if the hotel advertised honestly and just simply stated that you have to pay for Wi-Fi, but it was the principle that it was falsely advertised and she knew. That's what left a "bad taste" about this place. The hotel provided two computers in the lobby for use, but there would be so many people waiting to use it that by the time you finally have access to one of them, you have people literally hovering over you and breathing down your neck looking at what you're doing and wondering when you're going to be done. The front desk lady was curt and short when checking us in, so we didn't particularly feel comfortable asking them any further questions about the hotel or sightseeing. Breakfast was included, the rooms were spacious and clean, the bathroom was very spacious as well, and the windows were large with lots of natural lighting. The hotel was walkable to the metro and various restaurants nearby. Not too far from subway station. Affordable price. It's an ok hotel. Nothing special. Staff is not friendly. Wireless is not free although when I booked it there was a green sign on wireless internet in the room that I booked which usually means free wireless but when I arrived they charged anyway. Overall I don't like this hotel at all for a price of a single bed room that I paid. The office and common areas were old and deteriorated but the rooms have been renovated. Our room has high ceiling and is very large in size. The room faces a busy street but we were not disturbed by any noise. My husband and I loved the breakfast buffet. I am quite often in Berlin and I stayed already in all the type of hotels - from hostels to 5* But the last experience with Olivaer is something exceptional - negatively speaking. I can highlight only the location of the hotel - it is just few steps from the famous Ku'Damm. The hotel is not 3*, but most likely 2* or a hostel. The rooms are quite big, but already out of use: old furniture, used carpet, not renovated long time. The staff is unfriendly and helpless, with no wish to make something for you. We were not welcomed as guests there. We booked a double with extra bed for a child and received the twin with the sleeping chair, not suitable to sleep on. For this extra “bed” they charged 25 Euro! WiFi (WLAN) announced to be available on all the rooms (costs you once again some extra money), was not working. Means, we were looking for the hotel with the comfortable bed for our daughter and with WiFi – and finally received just nothing! The breakfast was more or less OK, if you don’t pay any attention, that you have to ask for everything – spoons, knives, hot coffee ect. If you are after 8AM, all the “hot” dishes are already cold. The majority of the guests are the young people or the big groups, which are coming with the bus excursions to Berlin. So, it would be quite OK to sleep 1 night for low price, just look for something else, there are a lot of nice hotels in this area. Good values for money. However I changed my room during my 12 days stay and both rooms were very different in quality. The first was big but no internet access, the second was samller but more modern and with internet access. The breakfast is reasonably good for a three star hotel and despite its superb location the hotel is quiet. 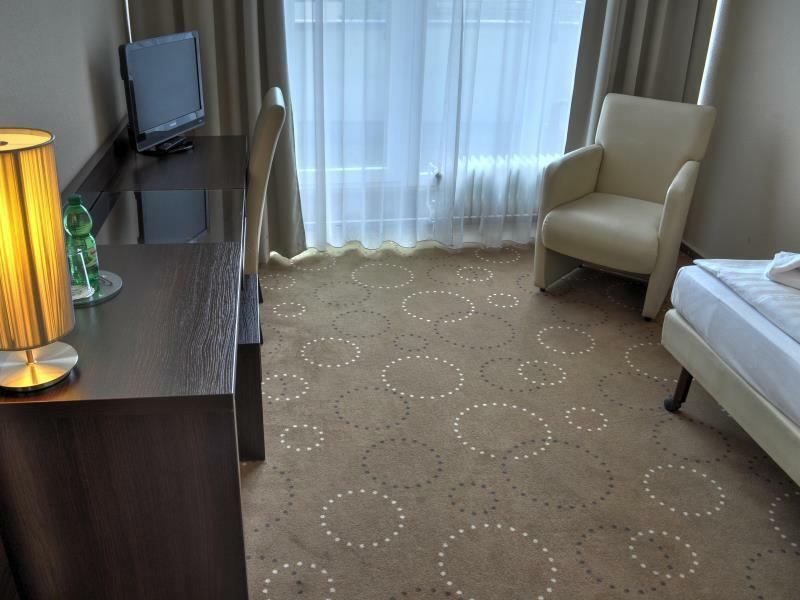 Hotel room is spacious and staff are friendly, Room is very clean. location, breakfast are very good. when you first arrive and see the entrance area, you might think that it's a really cheap hotel. but when you go to the room, it's not that bad. i got the top floor with a big balcony. in fact i felt it's great value for the price. they should really redecorate the sitting area on the ground floor. I had a noisy room next to the breakfast room - Desk staff (other than a trainee & a substitute from the Mitte hotel) were very brusque & unfriendly. If you are German speaking, you will get much better service. I found the desk staff to be very curt. The rooms were clean, the breakfast was good. The hotel is well located next to subways and buses. The shopping area is rather upscale, however I walked mainly in the direction of the 'Zoo' train station. If you book a room online be certain to request a room away from the kitchen and breakfast room. Todo muy bien, la única pega que le pongo es el wifi que nos dijeron que no funcionaba pero me da a mí que es que no lo tienen. Abgekommene Möbel, lautes Wc, Wasser abgestellt am Morgen, sehr kleines Zimmer, sieht nur sauber aus aber ist es nicht, Gesamtbild das Hotels sehr hässlich, Personal extrem lustlos, einmal und nie nie nie nie wieder. Für den Preis gibt es sehr schöne Alternativen. Sollten meiner Meinung nach schließen..